Apple is inching closer and closer to becoming a $1 trillion company today after posting third quarter results that beat out what analysts were expecting and bumping the stock another few percentage points — which, by Apple standards, is tens of billions of dollars. The company’s stock is up around 2.5% this afternoon after the report, which at a prior market close with a market cap of around $935 billion, is adding nearly another $20-plus billion to its market cap. 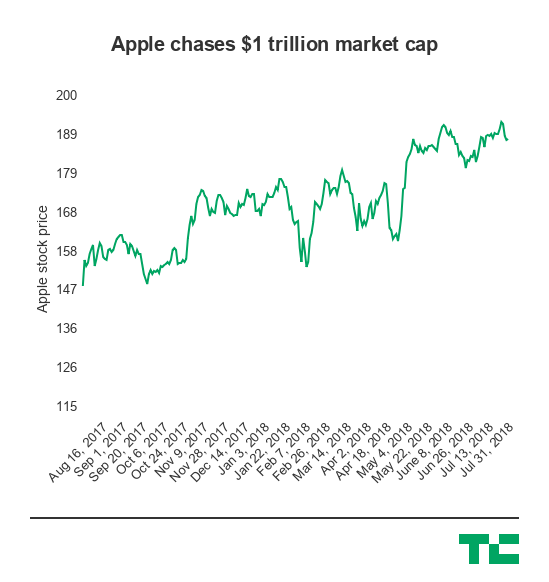 A few quarters ago we were talking about how Apple was in shooting distance of that $1 trillion mark, but now it seems more and more like Apple will actually hit it. Apple is headed into its most important few quarters as we hit the back half of the year, with its usual new lineup of iPhones and other products and its accompanying critical holiday quarter. Revenue: $53.3 billion, up 17% year-over-year compared to analyst expectations of $52.34 billion. iPhones: 41.3 million, up 1% year-over-year though revenue on the iPhone line was up 20% year-over-year. Analysts expected 41.79 million iphones sold. iPads: 11.55 million, up 1% year-over-year but ahead of analyst expectations of 10.3 million. Services: $9.6 billion, up 31% year-over-year. Other products: $3.7 billion, up 37% year-over-year. So in all, the shipment numbers were hit or miss at a granular level, but at the same time the iPhone is generating a lot more revenue than it did last year — implying that there might be a shifting mix toward more expensive iPhones. Apple’s strategy to figure out if it could unlock a more premium tier in consumer demand, then, may be panning out and helping once again drive the company’s growth. It’s then pading out the rest of that with growth in services and other products like it has in the past few quarters as Apple heads into the end of the year. In the past year or so, Apple’s stock has continued to rise even though there may have been some dampened expectations for its latest super-premium iPhone, the iPhone X. Its shares are up more than 20% in the past year, and in the second quarter the company announced that it would return an additional $100 billion to investors in a new capital return program, which at the time also sparked a considerable jump in its stock. Apple hasn’t delivered a product that has entirely changed the market calculus like it did when it first started rolling out larger iPhones, but its strategy of incremental improvements and maneuvering in Wall Street continues to provide it some momentum as it heads toward $1 trillion.